On a recent Friday evening in New York City, a collection of young magazine and newspaper writers sipped $15 gimlets at a hotel bar in SoHo, each clutching a peach-colored journal with the words "Girl Crush" spelled out in letter-shaped candies on its cover. The celebrants had arrived from the offices of well-known, even legendary publications  The New York Observer, The New Yorker, The Paris Review  to fete, with cupcakes, the launch of a zine: a handmade, self-published magazine intended for a small community of readers. For many, the word "zine" will conjure images of Xeroxed-and-stapled underground tributes to science-fiction fandom or '90s riot-grrrl culture. The form tends to be high on enthusiasm, low on production value. But Girl Crush, which features women writing about their female role models, has a glossy professional-grade binding and counts the Pulitzer Prize–winning novelist Jennifer Egan among its contributors. Neither the zine nor its launch party would strike anyone as countercultural in spirit. Edited by Jenna Wortham, a staff technology reporter at the New York Times, and Thessaly La Force, the former online editor for the Paris Review, Girl Crush is part of a resurgence in the zine form, particularly among media professionals. Like their rough-around-the-edges predecessors, these zines are independently published and precise in their editorial vision, but they have more star power and more mainstream editorial influence. Strikingly, often the same men and women who are helping to keep large media outlets afloat by day are also the ones going home and working on indie publishing efforts by night. 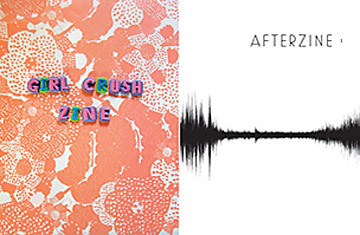 Girl Crush's peers include Afterzine, from Vanity Fair's digital design editor, Hamish Robertson; the Spanish-Italian interiors zine Apartamento, whose braintrust includes magazine writer Marco Velardi and fashion photographer Nacho Alegre; and The La-La Theory and White Elephant collections from Katie Haegele, a freelance writer and reporter. While a small and dedicated do-it-yourself zine culture has been publishing for decades, zines haven't enjoyed this much popularity in 20 years. Online craft mecca Etsy currently has nearly 50,000 distinct handmade publications listed for sale, approximately 3,000 of which are self-defined as zines; that number has been steadily increasing. "The biggest spike we have seen has been in the last three years," says Joe Biel, who runs Microcosm Publishing, one of the few organized zine distributors in the world and the country's largest. "We're getting more submissions than ever." But given the rising costs of producing print media, why would anyone  let alone media professionals  turn to DIY publishing instead of Wordpress or Tumblr? "It just feels good to make something by hand," says Wortham of Girl Crush. "I love the way pop culture morphs and evolves on the web. At the end of the day, though, you can describe a blog post, but you can't recreate it. It's really neat to hold something in your hand that you actually created." "There's a pleasure in making it difficult for yourself," Haegele says. "Other people appreciate it and it appeals to them when you explain, 'I sewed this together.'" A zine also has a prescriptive quality that contrasts with the more freewheeling tendencies of Internet publishing. "I'm the biggest fan of print in the boundaries that it creates, especially because my day job is working on the web," says Robertson of Afterzine. "Too many people think that you can just let the page get longer and longer on a website, and while that's true, it doesn't always make it better." So what makes a zine? And what distinguishes it from a small-run literary journal or a "photocopied blog" (as some zines have been derided)? The criteria vary from title to title, but a few basics are clear. A zine must be self-published and handmade. (Though even the concept of "handmade" varies widely: Haegele uses a typewriter and hand-stitches and presses her own binding, while La Force considers Girl Crush handmade because she learned Adobe's InDesign software solely to make it.) It's often published in small enough quantities that its creator can personally keep track of everyone who has it. It's self-funded and sold either at a loss or only to recoup the cost of production. It eschews advertising, though some zinesters will promote other zines in their pages. And a zine follows its own schedule. The editor of a traditional magazine or journal says "It's time to publish, so what are we going to say?" The editor of a zine says, "I have something to say, so it's time to publish." Girl Crush embodies this approach; so does Afterzine's themed issues, which so far have tackled negative space (issue one) and Los Angeles (issue two). See how the digital age is reshaping literature.